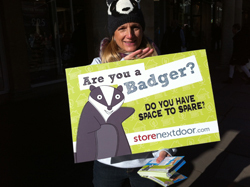 Storenextdoor spreading the Badger love! After almost four weeks of ‘soft launch’ we have been overwhelmed by the response so far! Almost 3000 visitors have come to the website to have a look and we already have 21 spaces listed by Badgers in Bristol and Bath. From a marketing point of view we’ve been firing on all cylinders. On Twitter we have been sending out news about the site and listings on our @storenextdoorUK account and in parallel @marvinsquirrel and myself -@missmobadger – have been doing our bit (although that you can’t keep that squirrel on track for 5 minutes before he’s off on one about those Butter Nut Nut @pieminister pies…). Facebook keeps growing daily with nearly 200 likes (it feels so good to be liked!) and now with my blog up and running there’s no stopping me! So – what with that and all the press coverage and the leafleting we are doing OK! …what do you mean you havn’t seen one..? I think we must have put one through every household in Bath and half of Bristol by now (I guess you either live in the other half or somewhere else in the country – well, don’t worry we have plans to get to you verrrrrry soon!). And here we are… the self-storage revolution ball has begun rolling…and we have gathered our first followers (I refer to you this fine Ted talk by Derek Sivers to back that up). It may feel like hard work at times but I can tell you that everytime we get a new ‘Like’ or another sign up on the website my little Badger heart skips a beat. I just wanted to say thanks to everyone that has supported us so far and to our first followers – we salute you! ← Collaborative consumption? What’s that about (and can I make some money)?